Why am I not surprised to read in The Korea Times that the Korean government is planning to set up an online app store? One reason is an incident I vividly remember that occurred sometime last year. My wife and I were waiting at a bus stop to catch the airport bus on one of our trips to the United States. Right in front of us, a policeman stopped a black sedan that had made an illegal U-turn a few hundred yards up the street. However, instead of pulling out a pad of paper to issue a ticket, the policeman punched some numbers into his mobile phone and showed it to the driver. Within a few minutes the whole process of issuing a traffic ticket was finished, with absolutely no uncertainty about the identity of the driver and other relevant details. In certain respects, South Korea is leading the world in e-government. The Korea Times article reports that the government is now looking to set up a government "app store" to improve the distribution of public information such as weather forecasts, traffic updates and job openings. An official from the Ministry of Public Administration said that the plan is to launch the app store as an internet site and then expand it to mobile platforms. By allowing the public access to and use of public information the private sector will be given the means to create more value-added services. It will be most interesting to see how the government's plans work out. Here in Korea, Samsung Electronics, LG Electronics and other companies are racing to develop advanced touch-screen technologies in the wake of the Apple iPhone's debut. And they should be racing. Back in December of last year, shortly after I had purchased my Apple iPhone 3GS, I wrote a post talking about capacitive versus resistive touch screens. The capacitive touch screens, led by the iPhone are the ones most prized by consumers because of their speed and responsiveness. Not surprisingly, the market for touch-screen mobile phones is projected to expand rapidly over the next several years. 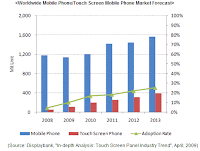 A recent study by Displaybank (click to see a full size version of the accompanying graphic) suggests that one in four mobile phones will be touch-screen models by 2013. I expect that most of these will be capacitive. As the processor speed of these phones increases, along with improvements in the touch technology, they will give users a sense of wielding the power to instantly retrieve and manipulate vast amounts of information with simple taps, swipes and other gestures of the thumb and fingers. These are indeed handheld computers, empowered by GPS, digital compass, other sensors and most importantly, high speed internet access. It appears that the leadership of SK Telecom, South Korea's leading mobile service provider, have not yet comprehended what is happening to the mobile communications market here, and the implications for their business, both medium and long term. As noted in the Joongang Daily, beginning next month SK Telecom will start charging customers for voice services on a per-second basis, rather than in 10-second increments. This will make Korea the fifth country to have such a charging system and will save SK Telecom users an estimated $14.5 million every month. However, at the same time SK Telecom announced that it would continue to block use of VOIP services on its smartphones! What is even more remarkable than the announcement as reported in the Korea Herald, is the company's reasoning that allowing its smartphone subscribers access to cheap internet calls using services like Skype will "deal a blow to its revenue." One probable result of SK Telecom's policy, if indeed they stick with it, will be an increasing number of its customers who drop SK Telecom's service in favor of Korea Telecom. That's what I did late last November and I haven't had a single regret. Skype, by the way, was one of the first applications I loaded on my iPhone 3GS and it works great! The leadership of Korea Telecom seems to have a better grasp of the revolutionary changes underway in mobile communications and greeted the SK announcement by saying that it would continue to focus on reducing mobile internet charges rather than on calling tariffs. KT is also moving broadly to offer useful content and applications, which will no doubt generate handsome revenues. SK Telecom would be wise to do the same, rather than cling to dwindling voice revenues as a source of future revenue. The next big battle in the semiconductor industry, as described by an article in The New York Times today, is over chips for the coming generations of hand-held mobile devices. As the article aptly begins, "The semiconductor industry has long been a game for titans." The going rate for a state-of-the art chip fabrication factory is about $3 billion. The plants typically take years to build and the microscopic size of chip circuitry makes for challenging engineering in order to keep up with Moore's Law. The next phase of chip wars will focus on smartphones along with tablet and notebook sized devices. Intel, which until now has had a very small presence in the smartphone market, is joining the fray. 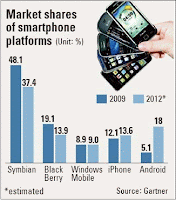 The current market leader is ARM Holdings. Global Foundries, a spinoff of Advanced Micro Devices, this year plans to start making chips at one of the most advanced factories ever built in Dresden, Germany. Global Foundries has been helped by close to $10 billion in current and promised investments from the government of Abu Dhabi. Other competitors in this industry include Taiwan Semiconductor Manufacturing, United Microelectronics and, of course, Samsung Electronics. The Eurasia Review and other sources are reporting, not surprisingly, that the North Korean government is again attempting to crack down on the use of Chinese cell phone services. One recent defector from North Korea reported that the North Korean authorities were jamming cell phone signals and that it was practically impossible to make a call. He said that "you can switch phone cards and the call appears to go through, but nobody in North Korea picks up." North Korea also appears to have made overseas purchases of expensive cell phone tracking and jamming equipment which it has installed at various locations in Shinuiju, Hyesan, and Hweryong in the border area near China, according to North Koreans living in border areas as well as those in South Korea. Several articles in the newspapers this morning offer concrete evidence that the convergence of digital media in South Korea is strengthening and accelerating. According to The Korea Times, both KT and SK Broadband are doubling their investment in IPTV this year from last year. They also aim to double the number of IPTV subscribers this year, over the number in 2009. Not surprisingly, The Korea Times report notes that IPTV is driving broadband usage and demand, particularly when it is bundled together with fixed line and mobile services. In fact, SK Broadband in partnership with SK Telecom will promote a "three screen (TV, PC and Mobile) package to smartphone and IPTV users. This reinforces a point made in my last post. With convergence people will sometimes use a handset, sometimes a tablet, and sometimes a desktop PC, but increasingly they want the same content available at the touch of a finger on all the devices. Three screens by no means represents the limit, since another new consumer trend is that people are putting the new flat screen television sets in more rooms of the house than just the family room or entertainment room, at least in Western countries. Google announced on Wednesday that, in an effort to spur innovation in the United States, it would launch a project to offer fast broadband service in selected communities. According to The New York Times, and a post on Google's corporate blog, the company will test a high speed fiber optic broadband network capable of allowing people to surf the web at 1 gigabit per second. How does this relate to Korea? As many of you know, this country is already building a nationwide fiber optic network that will deliver gigabit per second broadband speeds to all major communities in the country by 2012. If Google and Korean policymakers are correct, this should make South Korea, along with Google's selected communities in the U.S., centers of innovation! I've been puzzling a great deal these past several months over the paradoxical situation that exists in South Korea. On the one hand, this country has the most advanced and extensive digital networks in the world, yet it managed to lag behind much of the world (80 or more other countries) by two and a half years in adopting mobile broadband, as symbolized here by the Apple iPhone. How could a country that invests so much in education, R&D and infrastructure, find itself in this situation? The following are some thoughts I have. They are only initial attempts to find an answer, and I'd love to receive some incisive comments on this post. The information and communications technology (ICT) and telecommunications sectors in Korea are dominated by large companies, including the chaebol groups. Inside these large companies the workers and the labor unions exert a great deal of influence, making it difficult for them to adapt quickly to technological change. The established mobile service providers, along with the manufacturers of handsets and network equipment, were making a lot of money with the current arrangments, so why upset the apple cart by introducing the iPhone or Android phones to the Korean market? If we include the government here, another interpretation could be that, while profitable in the very short term, this was a costly policy mistake for Korea over the medium to long term. Finally, I cannot help but observe that language and culture played a role in all of this. After all, Koreans have not yet widely adopted Google as an internet search engine, preferring Naver to search within a Korean-language walled-garden. Heavy dependence on Naver and other Korean language portals, along with overly-heavy reliance on Microsoft, undoubtedly contributed to the lag in introducing real mobile broadband via the iPhone and Android phones. These are some of my preliminary thoughts. What is missing in this picture? I invite your comments. The Korean government has announced that it will spend $341 million to fund a four year program aimed at enhancing the country's information and communication technology sector. According to the Joongang Daily, the money will be used primarily to train basic researchers for the corporate world, with lesser emphasis on training for employees of government agencies and in the IT convergence sector. The money will be given primarily to universities across Korea to develop training programs and provide students with financial support. The primary emphasis of this new funding, in a departure from past patterns, will be on graduate level training rather than undergraduate. 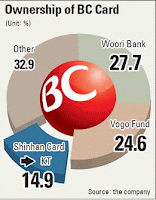 An editorial in the English edition of the Chosun Ilbo today declared that "Korea's E-Business is Mired in the Past." It pointed out that people in Korea cannot shop online, do internet banking, or access government or tax office sites using their smartphones. The editorial notes that this is unheard of in the 80 other countries that introduced smartphones (read Apple iPhone and Android phones) before Korea. The reason for this situation is the officially certified electronic payment standard used in Korea, which was introduced in 2000. To meet that standard, local companies developed solutions that were only compatible with Microsoft's Internet Explorer browser and required use of ActiveX controls. 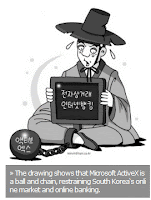 According to the Chosun Ilbo, Korea is the only country in the world to use a certification program using only ActiveX functions. Furthermore, it notes that other countries have chosen standard web technologies that can be used on both personal computers and smartphones and do not require users to download one ActiveX security program after another to make a single electronic payment. Not far in the future, when a housewife is caught in an unexpected rain shower, she won't have to rush home to close the apartment windows. Instead, she will be able to use her cell phone to shut the window through a ubiquitous home networking system. Not only windows, but almost everything in the home will come under the control of its owner when home networking is fully realized. As outlined in The Korea Times, the government this year is preparing standards for such home networking systems. Starting March 2011, any newly-built apartments will have to equip their network gateways with a general purpose engine developed by the state-run Electronics and Telecommunications Research Institute late last year. The engine will bridge the differences of various technologies or communication protocols. Older apartments will also be able to add the ETRI engine to their gateways as the government plans to offer the program free of charge to enable upgrades to older systems.